you are going to love the brand new Cadbury Freddo Faces. 14th anniversary of the Cadbury Freddo being introduced to the UK. Freddo is renowned for being a product targeted for kids. These 35.0g bags will be hitting the shelves at 52p. and you get approx 12 pieces in a pack. 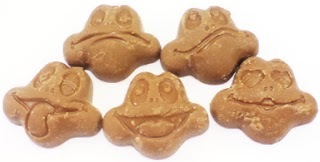 They are formed in a 'happy', 'grumpy', 'cheeky', 'confused' and 'in love' Freddo faces. Even the big kid in you at heart will love these Freddo faces. so you get your chocolate hit but not over doing it.